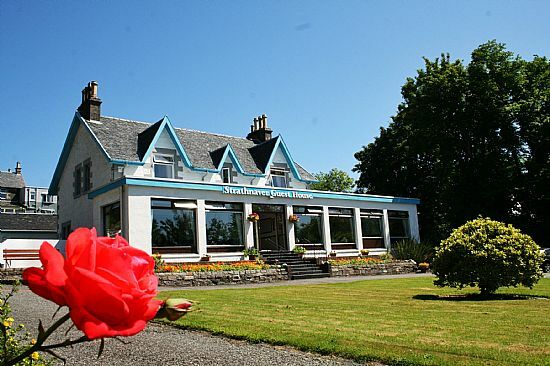 Strathnaver Guest House, Oban, Argyll, Scotland. Strathnaver Guest House in Oban wishes you a warm highland welcome. Strathnaver is situated in a fantastic location in the heart of Oban. We have excellent private parking with space for all guests' vehicles. Strathnaver Guest House in Oban has recently changed ownership,& is now managed by Cameron & Hazel. There has been upgrading of rooms & a dining room offering a greater choice at breakfast providing first class bed and breakfast accommodation. Strathnaver stands in its own grounds with direct access from the main A85 road from Glasgow. It is within easy walking distance of Oban rail and bus terminals, town centre and shops. Caledonian MacBrayne ferry terminal is a short walk from the Guest House. If you are planning a day trip on one of the ferries to Mull or Iona or one of the many other islands you can leave your car at the Guest House and walk to the ferry or we can call a local taxi to take you to the ferry. Strathnaver Guest House overlooks Oban Bay, with views of the town, the sea front and the Island of Kerrera. The view from our front bedrooms, feature lounge and dining room is stunning and makes the Guest house one of the most desirable properties in the town of Oban. Many Guests return year after year and if you take one look out of our windows it's easy to see why.